In 2002, she obtained a Bachelor of Fine Arts degree from the Complutense University of Madrid. In 2003 he completed a painting course at Slade School of Arts, University College of London (United Kingdom). In 2004 he obtained the Diploma of Advanced Studies after completing the doctorate courses, which gives him the research ability to continue with his research work in contemporary art; in 2005 he finished the Master in Theory and Practice of Contemporary Plastic Arts; and in 2009 he graduated from a master’s degree in figurative painting at the New York Academy of Art, in New York. 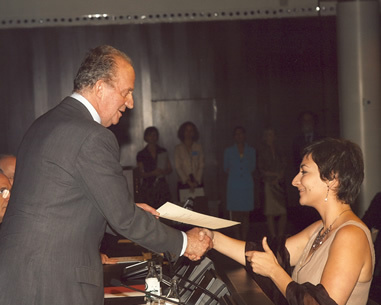 She receives several prizes among which these stand out: a grant from La Caixa for postgraduate studies in the USA (2006), an artist residency in the Andrew Freedman Home program in New York (2014 – 2015); the First Prize in the Montejo painting contest of San Miguel (2004); or the First Watercolor Prize C.O.A.A.T.M. (2002). Bouza has participated in several exhibitions of collective and individual character both in Madrid and in New York, among others. Ai addition to her work as an artist, Elena Bouza has developed a career as a naturopath, using art as a healing tool, as well as other natural therapy techniques. For further information visit elenabouza.com/terapias.